The Monk Antonii (Anthony) of Dymsk was born at Novgorod in about the year 1157. Upon a time once hearkening in church to the words of Christ: "Whoso wouldst to follow Me, let them deny themself and take up their cross and come follow Me" (Mt. 16: 24), the saint resolved to leave the world and take monastic vows under Saint Varlaam of Khutynsk (Comm. 6 November) at his monastery. 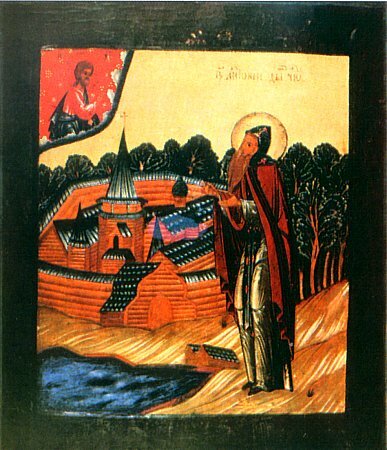 When he was dying, the Monk Varlaam established Saint Antonii as monastery head in his place; but Antonii, shunning glory, left the monastery and settled at the shores of Lake Dyma, in the outskirts of the city of Tikhvin. Here he founded a monastery and asceticised at it until the end of his own life. According to tradition, the Monk Antonii made a journey to Constantinople and through the holy places. The Monk Antonii died in the year 1224 on 24 June (on this day is made his memory). In the year 1330 his relics were uncovered undecayed, and from that time they were glorified by many miracles.